Map of CAMP LETTS Feel free to take a tour! 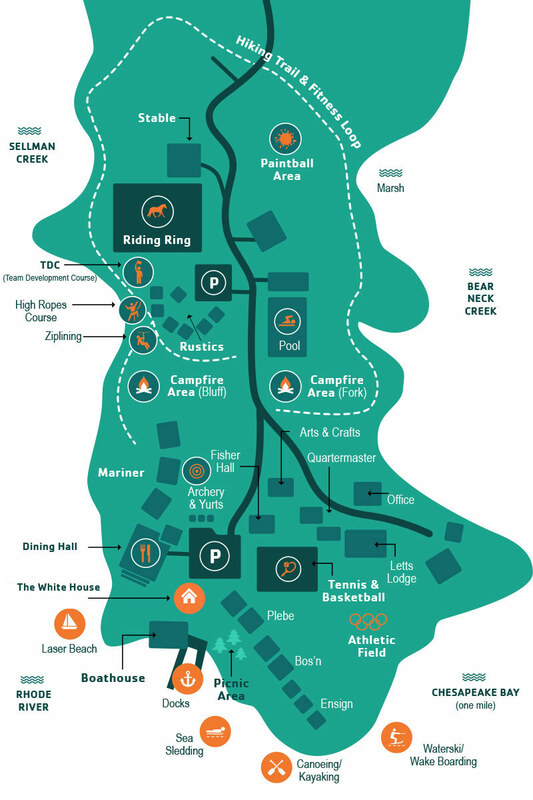 Click on the various Camp locations to see a photo of the area and a brief description of our beautiful property and facilities! 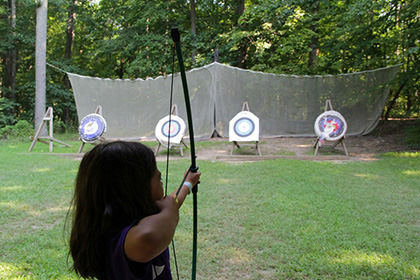 Learn the basic skills of one of the world’s oldest sports, archery! Our staff will instruct you in the basic skills of archery, and you can then practice and improve your aim by shooting at targets with a bow and arrow. 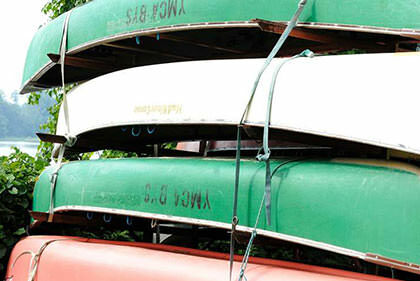 Launch kayaks and canoes, or play in the sand and water at Laser Beach. The docks are where we keep our fleet of sailboats - learn the basics in our very stable Rainbows, or learn-single handed sailing in our Laser and Optimist fleets, or try power boating, skiing, or sea-sledding. 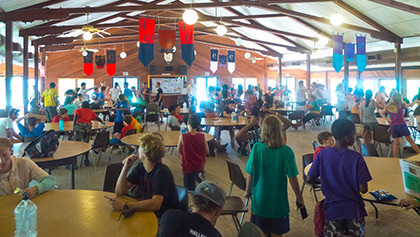 With beautiful views over the Rhode River, right down to the Chesapeake Bay, this is a favorite meeting space for Camp guests year round. With restroom facilities and heating, this building can host up to 100 participants in lecture style seating. During the Summer we utilize this space for a wide range of fun activities, from dance classes to martial arts and drama to slumber parties! 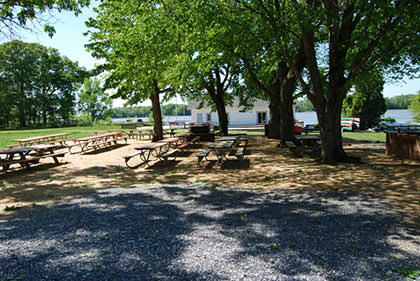 The picnic area is a great place to enjoy an outdoor meal, have meetings, play games, and just hang out. Lodges have a capacity of 24 to 28 guests in each of the 12 buildings. Each lodge is divided into three rooms. The two end rooms are dormitory–style bedrooms with either 10 or 12 beds and a bathroom. 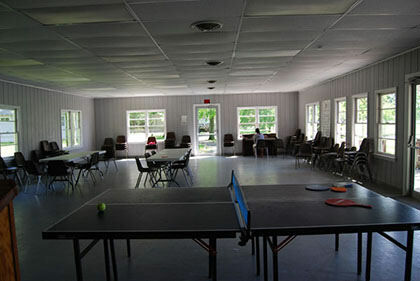 The center room is used as a common area. Our athletic fields can accommodate about any sport you may wish to play. Enjoy three tennis courts, a lighted basketball court, and a beach-sand volleyball court. 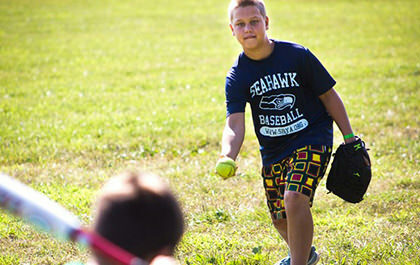 You may gather your team and challenge another family to baseball, soccer or football on our grassy playing field. For smaller competition, pitch horseshoes or roll the bocce ball. Express yourself with Arts & Crafts! 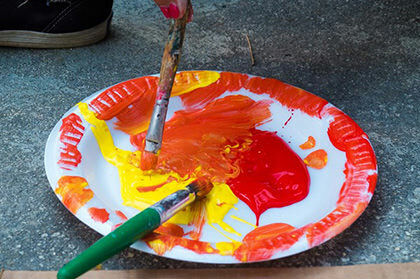 Paint, collage, make jewelry and ceramics, or participate in our fashion program. 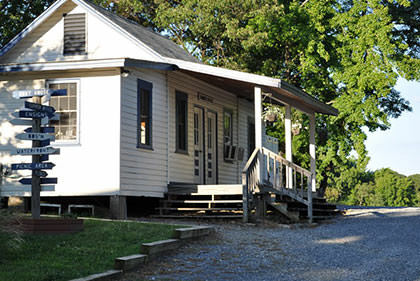 The oldest remaining building on the Camp Letts Peninsula, Fisher Hall is great for parties and retreats. It seats 90 people lecture theater style and has full restroom facilities, heating and air-conditioning. 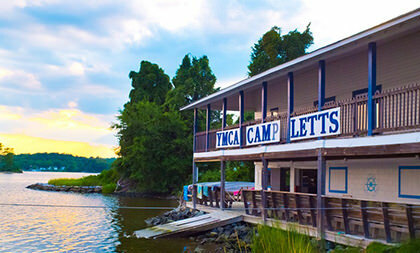 In the Summer, this is the central location for our Summer Day Camp. 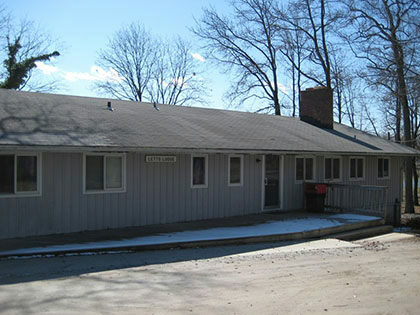 An administrative space used by Camp Letts staff. See the world from a new perspective – 35 feet in the air! This course is designed for individuals and teams who want to step outside of their comfort zone and accept a personal challenge that is both physically and mentally inspiring. With our 13-element High Ropes Course, a challenge can be found for every climber from terrified novice to adventurous dare-devil. 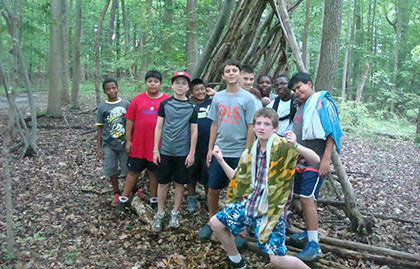 Here at YMCA Camp Letts, success is measured by a willingness to try! Participants work with our trained facilitators at a group-specific pace toward any goal you may have. By creating a foundation of communication and trust through challenging activities, groups can become more efficient, have more fun, and raise the overall quality of work. We work with new groups as well as teams that have been together for years who are looking to have a catalyst for change. We serve three well-balanced meals daily in our clean, spacious, air-conditioned dining hall. Our nutritious menus include fresh fruits, low fat milk and vegetarian options. Our salad bar has been a huge hit and we will continue to expand it in 2011. All menus are approved by professional dieticians. Our hiking trail holds the allure of nature. There are several spots along the trail that offer beautiful views of the water. At these stops, you can clear your mind of everyday clutter and allow for peaceful downtime to refresh your spirit. 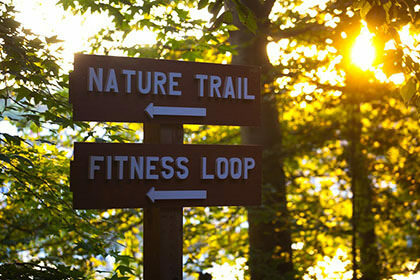 The newly added Fitness Loop offers Fitness Stations along the trail with a variety of exercises. Each station has instructions for multiple workouts at different degrees of difficulty so progressions can be designed to meet individual fitness goals. Located within the natural setting of Camp Letts, our paintball course offers you the chance to test your teamwork and strategic mind. 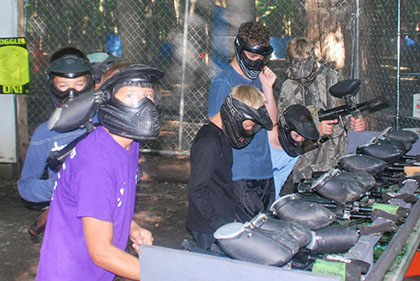 Camp will provide safety gear, equipment, and paintballs; we recommend you bring long sleeves, pants and tennis shoes. Our trained staff will give a safety preparation talk at the beginning of the session and will oversee a variety of games. 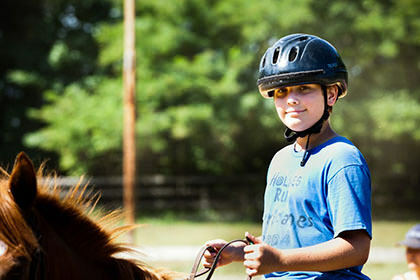 The horses and ponies at YMCA Camp Letts are chosen specifically for their gentle, friendly natures. They can be ridden safely & are quiet and dependable both in the ring and on trails. They love attention & enjoy having their riders bring them treats — especially fresh carrots! Come out & get to know their different personalities. With four campfire sites of varying sizes set throughout the camp, there is a spot for everyone. 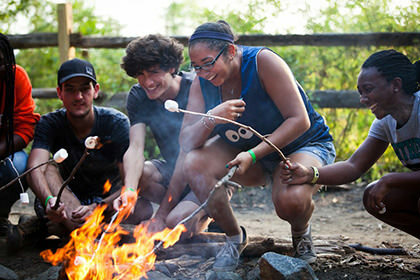 Just add s’mores, camp songs, good friends and an open mind. 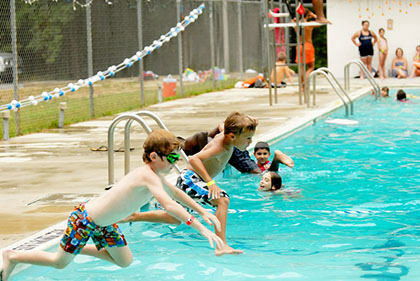 Our 25-meter outdoor pool is open Memorial Day through Labor Day with certified lifeguards overseeing your safety and fun. 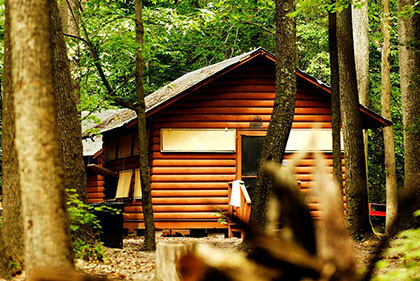 The Rustic cabins are within walking distance to bath facilities and & program areas. They are situated in the woods away from the main camp. We have seven cabins with 12 built-in beds in each. 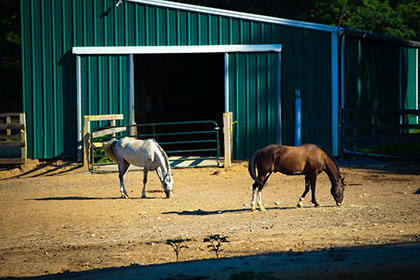 The YMCA Camp Letts Equestrian Center is a 15-stall barn located 30 minutes from Washington, D.C., and Baltimore. The center features miles of waterfront trails, a 100-by-220 foot lighted outdoor ring, cross country jumps, & a small sand dressage arena. The program includes traditional lessons for all levels & ages 8 and up, guided trail rides, Scout badge programs, & an Equestrian Team for those with competitive aspirations. Race across the water on one of our giant sea sleds! 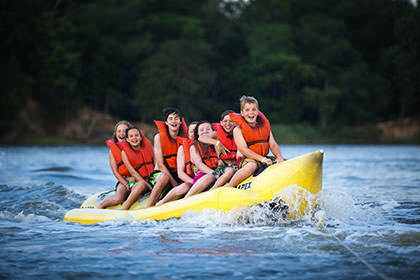 Launch into the Rhode River for adventure and exploration! Explore Bear Neck and Sellman Muddy Creeks, or take a relaxed paddle over to Flat Island - whatever your desire, we have an abundance of islands and inlets to explore. 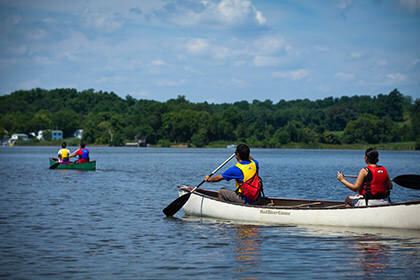 After a short class from one of our experienced instructors, you can leave on a guided tour or start you own expedition on some of Maryland’s most beautiful waters. 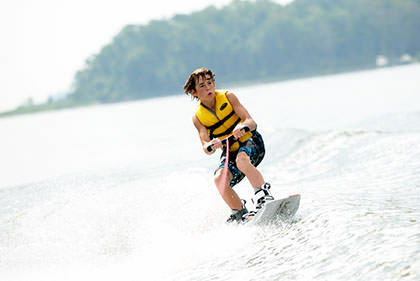 Whether it’s your first time on the water or you’re a free style pro, our experienced staff are ready to guide you. Our program concentrates on individual progression and a true belief that anyone can ski. 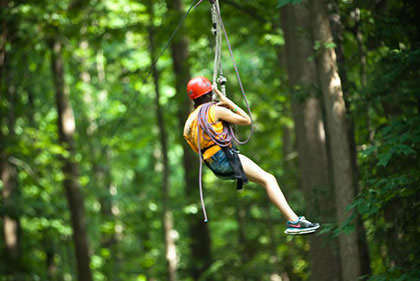 Zoom down our 250 foot Zip Line through the trees! 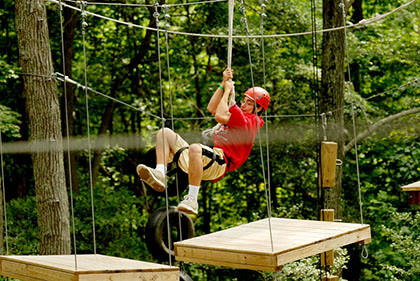 Experience a safe and thrilling way to enjoy the beauty of camp and nature.